Telegraph Cove. dIScoveR the beSt kept SecRet on noRtheRn vancouveR ISland. Nature Calls See a whale. In the wIld. Scan for your exclusive tour sneak peek! Close totoVictoria, nearnear the marina, and 5 minutes from Close Victoria, the marina, and 5 minutes from picturesque Sidney, British Columbia. picturesque Sidney, British Columbia. You can have the life you want here at Regatta Park, in these spacious new condominiums built within a parkland setting, marina adjacent, and just 5 minutes from Sidney and 30 minutes from Victoria BC. Pre-sales start Fall 2016. Learn more and live large, today. THIS NOT OFFERING FORANY SALE. ANY SUCH OFFERINGS ONLY MADE WITH A DISCLOSURE THIS ISISNOT ANAN OFFERING FOR SALE. SUCH OFFERINGS MAY ONLY BEMAY MADE WITHBE A DISCLOSURE STATEMENT, E & 0.E. STATEMENT, E & 0.E. The debate rages about which is better: a catamaran or a monohull. Here are some considerations to help you decide which platform is best for you. Printed in Canada by Transcontinental Printing. Ideas and opinions expressed within this publication do not necessarily reflect the views of Page One Publishing Inc. or its affiliates; no official endorsement should be inferred. The publisher does not assume any responsibility for the contents of any advertisement and any and all representations or warranties made in such advertising are those of the advertiser and not the publisher. No part of this magazine may be reproduced, in all or part, in any form — printed or electronic — without the express written permission of the publisher. The publisher cannot be held responsible for unsolicited manuscripts and photographs. Canadian Publications Mail Product Sales Agreement #41295544 Undeliverable mail should be directed to Page One Publishing Inc. 580 Ardersier Road, Victoria, BC V8Z 1C7. 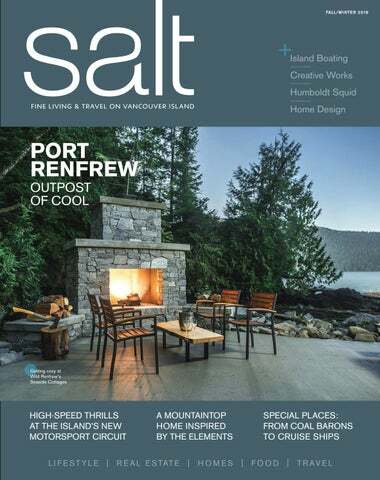 Salt magazine is a registered trademark of Page One Publishing Inc. Call Leslee Farrell at 250.388.5882 for assistance with your local and global real estate needs. That vibe When patios buzz with laughter, conversation, and the clink of glasses. Lights sparkle and those wonderful outdoor heaters make sitting outside comfortable well past summer. It's so easy to gather friends for evenings like this. We all want to be here. Where dream homes become reality. Get the best of both worlds; an idyllic natural setting only minutes from the allure of Victoria. Live amongst the rolling fairways of Nicklaus Design Golf Courses and The Westin Bear Mountain Golf Resort & Spa. Both Cycling Canada and Golf Canada call Bear Mountain home, and you can too. E V E RYONE IS TAL KING A BO U T T HE O AK B AY BE AC H HOT E L ! Experience luxury and relax on a beautiful island in the Pacific Ocean with the ones you love. Come see why everyone is talking about Victoria’s Oak Bay Beach Hotel, a boutique seaside resort and spa carefully designed for one thing in mind... your personal wellness. This Fall and Winter, quote the promo code “WELLNESS” to access special rates. NO STORE LIKE IT Anything you need for Island life, you can probably find at Capital Iron. Gumboots, crab traps and pots, rain capes, outdoor kitchens, patio sets, mason jars, garden tools, camping gear, boating equipment, umbrellas. It’s like taking a trip back in time to the days of general stores, but one that is perfectly attuned to Island life. And after more than 80 years at this location, they have a pretty good handle on what we need. Ruth & Dean’s 12-layer Neapolitan cake, with vanilla and chocolate layers, strawberry compote, and strawberry buttercream. and rum. The beautiful tasting room is open daily. 4 Blue Grouse Estate Winery in the Cowichan Valley is one of the Island’s oldest wineries. The property was used as a test site for grape growing back in the 70s. The Kiltz family discovered the vines and, in the 90s, started making wine. In 2012, the Brunner family fell in love with the property and bought it. THE BAG! SILK ROAD TEAS are now available in a revolutionary teabag that is a first for North America. Designed to seal in freshness, offer a higher release of antioxidants and deliver superior flavour. Enjoy the convenience of a teabag without compromise. The only things that should be in your tea are fresh, organic and all natural ingredients. NO ARTIFICIAL FLAVOURS, COLOURS, SWEETENERS, DAIRY OR SOY. GLUTEN-FREE. ON THE GO ISL AND CULTURE Built to hold your laptop and a cup of coffee! Winter on the Wild West Coast Storm watching is a huge draw to the West Coast of the Island. From November through February, storm watchers descend upon Tofino and Ucluelet hoping to see Mother Nature at her most furious. Massive waves, gale-force winds, and deafening surf blast away the winter blahs, while luxurious hotels and spas and fine dining provide therapeutic balance. 1 Cape Scott Provincial Park, North Coast Trail > An epic backpacking hike for experienced hikers, this six-to-eight day hike allows you to see Vancouver Island at its wildest and most pristine. Plan carefully for self-sufficiency and leave your dog at home; there are wolves and bears. Within this 250,000-hectare park, Buttle Lake and Forbidden Plateau are the most developed areas. Trail maps are available. Routes range from 20 minutes to several days. Parksville > This park is loved for so many reasons: swimming, mountain biking, horseback riding, salmon viewing, and hiking. The trails add up to just three kilometres, but they are very pretty and lead through the forest to two beautiful waterfalls. Alberni > Two kilometres of easy walking trails are located within the park, as well as a 7.5-kilometre route that starts from the park and follows the river. This is a salmon river, which means bears in the fall. 5 Kinsol Trestle, Cowichan Valley Trail First built in1920, this is the largest of eight trestles along the Cowichan Valley Trail, a cycling and hiking route that’s part of the Trans-Canada Trail. There are a number of access points with parking. flash-roasted Tandoori Humboldt squid and even in coconut curried seafood biryani. “Finally, I can serve squid again,” says Ghose who serves only Ocean Wisecertified seafood. “I haven’t been able to serve regular calamari because it’s not considered sustainable, but Humboldt Squid is fished along the west coast from Mexico to Alaska, and there’s no worry about overfishing.” Jeff Keenliside, executive chef for the Oak Bay Marine Group, serves this sustainable squid on his Ocean Wise menus, too. From the chunky buttermilk-fried calamari and the shawarma-spiced grilled Humboldt squid at the Marina Restaurant to the saltand-pepper squid served on the Canadian Princess in Ucluelet, it takes to both simple and exotic preparations. “We use it a lot — it’s so much easier to use than baby squid, there’s such a high percentage yield and no waste,” says Keenliside. And it’s delicious. That’s why you’ll see it served in a crispy squid and bacon clubhouse wrap or a smoky grilled-squid entree at Vista 18, flash-fried with shaved fennel and roasted shishito peppers at Canoe, or offered up as calamari strips with roasted tomatocaper aioli at the Six Mile Pub. Island Inspired It is well known that the Island is home to a rich, diverse community of creative people. Whether born here or drawn here, artists of all kinds create works that find homes all over the world. Here are three locals who have caught the attention of art lovers from far and wide. Top: Spirit of Inquiry, 18" x 35"; bottom: Impromptu, 18" x 18" Opposite page: Topography, 18" x 24"
For the past five years, Brandy Saturley’s gaze has been fixated on Canada. A prolific painter of Canadian contemporary realism, Saturley has concentrated on three bodies of work celebrating Canadian culture and working towards a retrospective exhibition for Canada’s 150th birthday in 2017. “Canada is a pretty special place to call home, and I feel gratitude every day for the life I have created for myself here in this beautiful country,” she says. She even coined the term #iconiccanuck. “I always tell people I meet or spend time with that they are likely to end up in one of my paintings, literally or figuratively.” < Golden Ram, 36" x 36"
“In the act of creating, I am seeking knowledge. When the piece is finished, I am seeking connection with others.” < Let Your Backbone Rise, 36" x 36"
Andy Stephenson and his team of adept specialists are dedicated to pairing cherished properties with remarkable lives. Committed to handling every aspect of a home sale with utmost care, Andy has assembled professionals with experience in luxury real estate to ensure your interests are best represented throughout. By utilizing his extensive local knowledge and vast global network, Andy is able to find the lifestyle and community that makes a house feel like home. LOCAL EXPERTISE, GLOBAL CONNECTIONS Sotheby’s International Realty Canada, Independently Owned and Operated. E.&O.E. : This information is from sources which we deem reliable, but must be verified by prospective Purchasers and may be subject to change or withdrawal. Not intended to solicit properties already under agreement. GIFT THE PERFECT ESCAPE Give the gift of an experience that will leave a permanent smile on their face. We invite you to discover the very best of Canadaâ&#x20AC;&#x2122;s only year-round motorsport facility through a unique getaway package for any driving enthusiast. For two amazing days, get a glimpse of life as an exclusive member of the Vancouver Island Motorsport Circuit. Stay at our beautiful partner hotel, the Villa Eyrie Resort, nestled high above Victoria and the Pacific Ocean. Enjoy decadent dining, luxurious spa treatments and a truly personalized performance driving experience. T O B O O K T O D AY O R L E A R N M O R E , V I S I T C I R C U I T VA C AT I O N S . C A O R C A L L 1 - 2 5 0 - 5 0 8 - 2 4 2 0 . This offer is available for a limited time only. ELEMENTS OF STYLE THIS DRAMATIC MOUNTAINTOP HOME DRAWS ITS DESIGN INSPIRATION FROM THE ELEMENTS OF NATURE. picture is worth a thousand words, and for Debbie Austen, it is also a powerful inspirational tool for making her home an authentic reflection of who she is. Austen and her husband purchased a turquoise-splashed Peter Lik photograph called Tahoe Jetty (Emerald Bay, Lake Tahoe, California) on a family holiday — years before the home they were dreaming about was even designed. The 59-inch-wide print stayed boxed while they juggled raising a family, careers, and caring for elderly parents. But the image remained in Debbie’s mind’s eye both for its colours and the way it represented their evolving lifestyle as it shifted from the cautious family-raising years to a new chapter. With its multi-angled sloped roofs, the home sits like a crown on the top of the mountain. Its exterior — with its mix of materials, including Iron Mountain acrylic stucco, corrugated metal, and wood accents — is dramatic without conflicting with the natural world. The home is a calming oasis swathed in a gentle, neutral palette but with bursts of energizing colour in strategic places. The rule of three is employed for wall colours (Benjamin Mooreâ&#x20AC;&#x2122;s Metropolis, Thunder, and Balboa Mist with the ever-popular Cloud White on trim and ceilings). The kitchen, at the heart of the home, is anchored to the earth by dark cabinets and a cream-gray-silverspeckled quartz countertop. Continuity is maintained through the open space with complementary cabinetry set against whitewashed wide-plank oak flooring. The glass-fronted cabinet in the hallway, full of wine, sherry, and water goblets, is one of the places where the owner has held on to pieces from her past. All together, the collection feels like a piece of art. The entrywayâ&#x20AC;&#x2122;s extra-wide fir door grounds the space and provides a visual contrast to the lightness and airiness of the numerous windows and floating staircase. While the home is thoroughly modern, the owner mixes, to good effect, a few sentimental pieces of furniture. The owners didnâ&#x20AC;&#x2122;t want to give up the views from anywhere in the home, which created challenges in the master bathroom. Pleated window coverings that raise from the bottom permit maximum light and views in the bathroom while providing privacy. < A frosted window in the roomy shower emits natural light to an area that otherwise can be dark. Floating cabinets, all with under-lighting, creates fluidity and a sense of spaciousness. t’s a gorgeous, sunny day in the Cowichan Valley, so there’s no need to worry about water on the asphalt as I ease the Subaru BRZ around a hairpin turn and hit the gas. The sporty blue car shoots forward on the straightaway with a satisfying roar, but I brake a little too sharply for the next turn, so the tires squeal and the back-end drifts over the rumble strip. On the Trans-Canada, this would definitely qualify as reckless driving, but this is the Vancouver Island Motorsport Circuit — the first motorsport-themed country club in Canada — and I’m learning that when you take away speed limits and other concerns of the highway, driving is a hell of a lot more fun. It’s a discovery that Peter Trzewik, partner at GAIN, the Vancouver Island-based luxury dealer group behind the motorsport development, is hoping other drivers will make. “This is where people can find out what a car is really built for,” Trzewik says. “Many people who buy our cars have no opportunity to test that car’s true performance capabilities — and really shouldn’t on public roads.” GAIN, previously called the German Auto Import Network, started with one store, Three Point Motors Mercedes-Benz in Victoria in 2008, but now has nine Island dealerships, which represent 11 distinct brands. As part of the circuit’s regular operations, each of GAIN’s dealerships will have access for client days and performance training. When I arrive for one of the motorsport circuit’s media days prior to its official opening, an impressive sampling of the cars available from the dealerships is waiting, including an Alfa 4C Spider, an Audi S3, BMW Z4, a Mercedes C63, and a 2017 Porsche 911Carrera S.
The 2.3-kilometre track was designed by Tilke GmbH of Germany, considered the “brand name in track design.” Headed by engineer and former auto racer Hermann Tilke, the company has built almost all of the new Formula One (F1) circuits since 1999. This is Tilke GmbH’s first private Canadian project. We leave Victoria on a clear morning for our two-hour drive along the twisting ribbon of West Coast Highway to Port Renfrew. Our first stop is the seaside slip of a village, Jordan River, where we order pizza flatbread at the funky Cold Shoulder Café then cross the road to watch surfers in wetsuits paddling out like seals. Jordan River is a Canadian surfing sweet spot for those willing to brave cold water, especially in winter when those big, frosty swells roll in. Back on the road, we pass a poetic roll call of signs for French Beach, China Beach, Mystic, and Sombrio. Soon, cell reception is lost and there’s every sense we’re going to the back of beyond. At some point, fields and forest give way to clear-cut swathes. It’s not pretty, but neither is it the whole story of Port Renfrew and the San Juan Valley. There’s a big reason Port Renfrew is home to the annual Tall Tree Music Festival — it has very, very big trees. Arrival in Port Renfrew is a bit of a surprise, as in “surprise, there’s no main street.” What qualifies as a main drag is the scenic wooden pier flanked by the cedarsided Renfrew Pub and Wild Renfrew’s Seaside Cottages, log cabins that promise rustic luxury and coastal charm. WE’RE ALONE HERE, YET NOT. THE PLACE HAS PALPABLE PRESENCE. A NEW ELEGANCE Eco-design meets antique décor when a spectacular renovation transforms a cramped 1970s cottage into the elegant pinnacle of sustainable living. The house was originally built in 1974. Its new, grander facade required an impressive entrance, and these antique Italian doors, circa 1880, were sourced from California, “as you wouldn’t find anything like this around here,” Scott says. Left: The fireplace epitomizes the way the home blends modern comforts with eco considerations. It is an energy-efficient Valor gas fireplace made from a traditional casting. Frank Arnold, the homeowner, found the antique mahogany surround, and JC Scott, the home designer, added the marble insert, using Vancouver Island marble. THE EXPRESSION “BEAUTY IS IN THE EYE OF THE BEHOLDER” DOESN’T REALLY APPLY ON VANCOUVER ISLAND. IT’S PRETTY WELL AGREED THAT BEAUTIFUL HOMES IN GORGEOUS SETTINGS SHINE ALL OVER THE ISLAND. AND IF YOUR GEM HOME CAN’T BE FOUND, ISLAND BUILDERS AND DESIGNERS CAN CONJURE ONE. Zebra Group’s Hampton Beach won gold in three categories at the 2013 CARE Awards. says. Such problems start with the building envelope. After many years of doing renovations, the company has seen how shortcuts and incorrect construction methods lead to building disasters. Pheasant Hill’s staff know how to keep a home dry and energy efficient, be it with passive housing (building methods that result in 8090 per cent less energy use than a traditional home) or net-zero construction (where solar and other installations produce a home where the total energy used each year is equal to the amount of renewable energy created at the home). Renovations run the gamut from whole home makeovers, kitchen/ bathroom/great room facelifts to single room fixes and exterior work. “And we work in a wide variety of architectural styles, from craftsman to modern,” Schmidt says. anaimo has always held a fascination for me. It was the very first place I visited on Canada’s West Coast in early 1992. It was serendipitous. I was on business in Toronto with a few days to kill and decided to fly across the country to visit my brother, who had arrived in Nanaimo from England several years earlier. Before I realized it, I was completely sold on making Vancouver Island my family’s permanent home. By December, my wife and I and our two young children were in Nanaimo — living the dream! Subsequent job offers enticed us to Victoria, but I have fond memories of living in Nanaimo. I mention this because it gives me a unique perspective on the city. In 1992, Nanaimo was a down-to-earth, hardworking, authentic, blue-collar town surrounded by incredible natural scenic beauty; it wasn’t known for its culture or its culinary experience, except for those wonderful Nanaimo bars and backyard salmon barbecues. There were plenty of shopping malls on the outskirts of town, but the downtown core had tumbleweed blowing in the streets. Okay, an exaggeration, but you get the idea. THE HARBOUR CITY HAS ONE OF THE LONGEST AND MOST PICTURESQUE SHORELINES IN CANADA. BIRTHPLACE OF DIANA KRALL AND BLUES ARTIST DAVID GOGO, THIS ONCE BLUE-COLLAR CITY HAS MORPHED INTO A CULTURAL CAPITAL. FOODIE HEAVEN One of the big growth areas in Nanaimo is its culinary diversity. In spite of fluctuating economic times, lots of new restaurants have sprung up to excite foodies like me. Three standouts are The Nest Bistro, downtown with a French/Italian slant; Hilltop Bistro at the north end of Nanaimo offering casual and unpretentious fine-dining; and just a little further north in Lantzville, Riso, an Italian restaurant featuring wood-fired pizza and entrées such as Vodka Prawn Linguine using locally distilled vodka. Nanaimo’s character and personality are different today. The city has become a nationally acclaimed cultural centre with outstanding restaurants. Above all, it’s a hip, funky place to live, shop, go to school, and do business. The resident population is growing quickly, tourists are beginning to hang around a while, and over 14,000 passengers from six cruise ships will walk ashore this year. An amazing metamorphosis has taken place since I first visited. And it’s not one thing, one strategy, or even a rebranding that’s responsible. It’s a bunch of initiatives, a changing demographic, and something almost indefinable that has simply given Nanaimo more heart and soul, more life, more urgency. Being out on the water off Vancouver Island is a different existence entirely. As you cruise away from the dock, you leave all your worries on land. THE MAGIC TRIANGLE Boating folk sometimes refer to a triangular diagram that encapsulates the trade-offs when choosing the comfort, performance, and economy of your catamaran. Move toward the performance corner and you lose some comfort — and another chunk of change. Shift toward greater economy and you lose a bit of both performance and comfort. A yacht broker can help you determine your needs along these continuums. The popular Leopard 40 from Leopard Catamarans is a good example of just how spacious and luxurious a catamaran can be. In some cases, these beauties have more room than a condo.